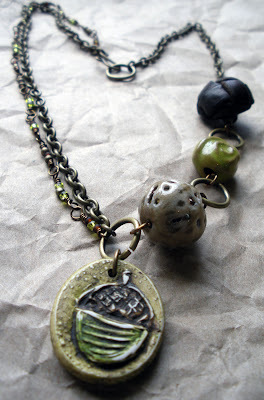 While many of our beady friends have trooped off to Bead Fest Philly, Heather Powers (of Humblebeads) suggested that those of us not lucky enough to attend have a Pity Party of our own. As such, she's got a list of bead shops with sales and three days of fun bead-realted activities for us to play along. Today is Bust your Stash day. 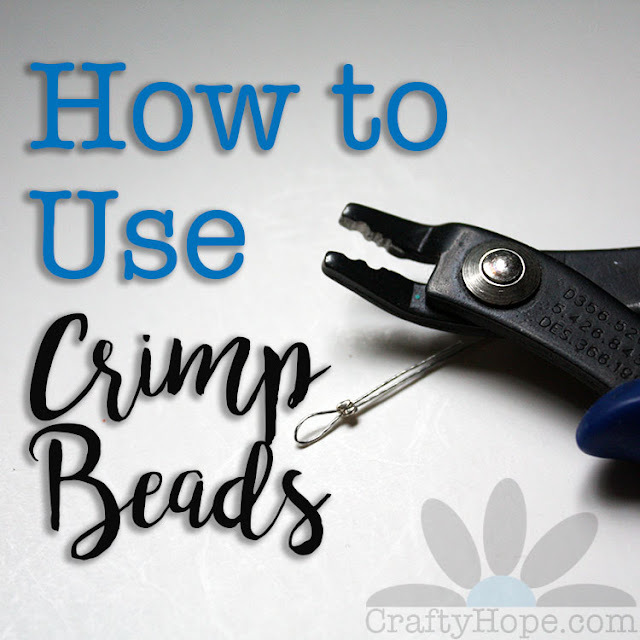 Heather has challenged us to use something that 'hasn't seen the light of day in a while' or something we purchased from a bead show. 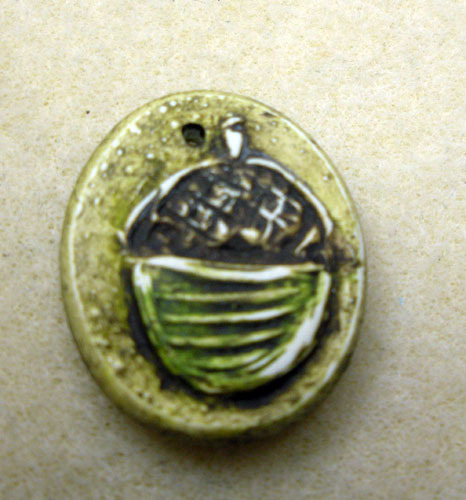 In honor of Heather's fabulous idea, I pulled out this awesome acorn pendant/charm I bought from her a while back. I also gathered up some other need-to-use pieces. 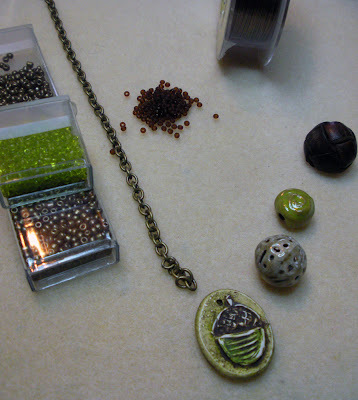 In addition, I selected some chain, wire, and seed beads and got to wrapping. In no time this beauty came together. Yeah, who needs to be at Bead Fest, when you can be at home playing with the awesomeness we have hoarded there? As well, there's a new bracelet in the shop. Tomorrow, Heather has challenged us to go on an Inspiration Adventure. Hmmmmm. Oh, and if you're looking for more of today's pity party, head over to Heather's own post about it. I love your Pity Party Necklace! And that peachy bracelet is just the sweetest. I hope to get someithing up on the blog this afternoon for the Pity Party myself, but there's lots of other stuff I need to tend to. I love the necklace you made from your stash! I like how you combined the seed beads, button and ceramic beads. Very pretty! 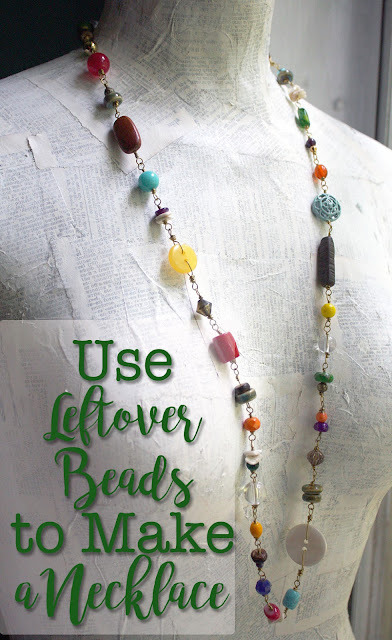 Love the idea of gathering up a few beads gathering dust and making something. You did a great job. Love the asymmetrical necklace. Simplicity is nice too letting the awesome beads do the design. Wonderful - I love that pulled out a Humblebeads in your stash busting!!! It's a fun mix of elements that make me want to hurry fall along. Your necklace is lovely. I have several of Heather's beads but I either haven't finished the piece or don't know what to do with it. Yet. Maybe I'll do some bead stash busting as well this weekend. Thank you for the sweet note on my owl pillows. Have a wonderful weekend! 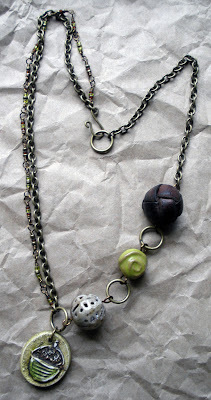 I just love the double chain on one side, constructed with seed beads. Awesome design! Backstory- I'm so glad that chain is going over so well. It was just one of those things. Thanks o much for popping in!! Great necklace and wonderful bracelet. I will be looking through my bead stash this weekend. love it, Hope! Speaking of hording, I bought a bracelet from you, and only just now gave it to my step-sister....she LOVED it! 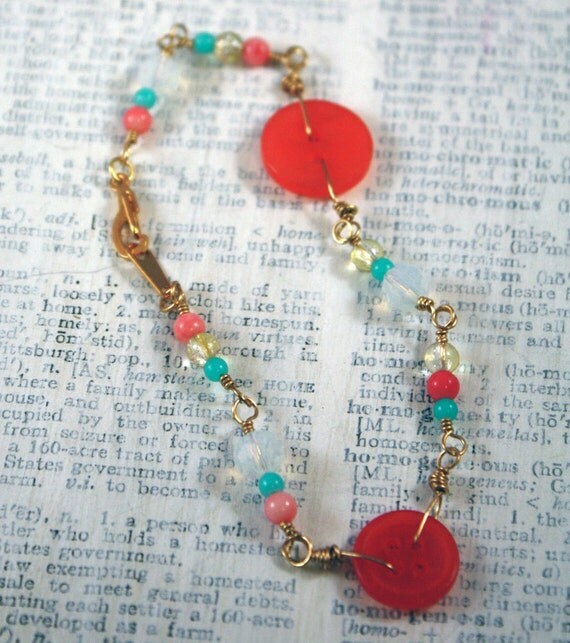 That is one pretty pity party necklace love the colors, if it were mine I would wear it often. The bracelet is very pretty also. See how fun that is!? I not only was busting my stash trying to put some things together, but also jumping ahead and learning something new. I hope I will be able to share what I made with my hoarded treasures by Sunday night! So glad you are playing along with us!